The wine has a fine bead and is a light golden-amber color. The nose shows toasted brioche aromas with fine citrus notes. The palate is powerful and full-bodied revealing great freshness and impressive length. 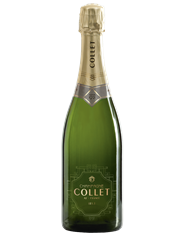 Collet Brut is wonderful as an aperitif and versatile enough to be paired with an array of dishes from oysters to light game such as rabbit terrine and seared duck breast.